By J. BLUNT, C.Eng. F.I.Min.E. The most successful Mines rescue operation in Great Britain was following the Knockshinnoch Castle Colliery accident in 1950 when a large volume of liquid peat and moss broke through from the surface into a heading in the main coal seam, cutting off a large part of the workings, including the two means of escape to the surface. Thirteen men were killed by the inrush and 116 men were entombed. Such was the magnitude of the inrush that there was no hope of clearing a way through the mass of sludge. All the men were eventually rescued by making a connection from old workings in a neighbouring mine. To do this the men had to be brought through a roadway about 800 metres in length in an irrespirable atmosphere, whilst at the same time the methane percentage was building up where the men were congregated. A human chain of rescue men wearing breathing apparatus was stationed along the roadway and the trapped men were brought out wearing "Salvus" compressed oxygen apparatus, after being given brief instructions how to wear the apparatus. This unique rescue operation took only eight hours from the time the first man commenced his hazardous journey to safety after having been trapped for more than two days. This incident led to the introduction of a short duration compressed oxygen apparatus-the "Savox" as the "Salvus" apparatus was not approved for use in mines and was loaned from local fire brigades at the time of the Knockshinnoch incident. 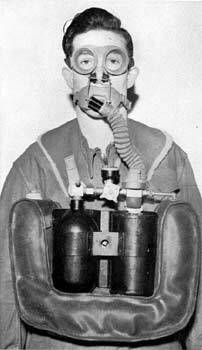 The "Savox" apparatus was primarily for the purpose of escorting untrained colliery personnel through irrespirable atmospheres, and each rescue station in the country was equipped with 10 sets in 1953. 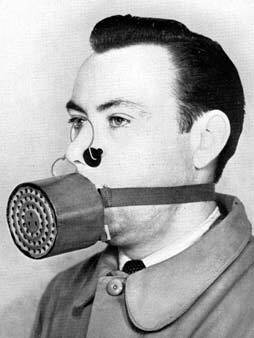 In 1972, the "Savox" apparatus was replaced by the "Minox" which is a one hour compressed oxygen set. This apparatus may be used by officials or specialists in an emergency for carrying out examinations or specialist work which cannot be done by normal rescue teams. Small numbers of selected men are trained in its use. During the last few years, efforts have been made to develop a simpler and lighter short duration escape apparatus as the "Minox" is not ideal for the purpose. Tests were proceeding at the time of writting this article in the 70s. Following the disasters which occurred at Whitehaven Colliery in 1947 and at Creswell Colliery in 1950, (Creswell Disaster) when large numbers of men lost their lives due to carbon monoxide poisoning, recommendations were made by the Chief Inspector of Mines that simple and suitable self-rescuers should be provided for men working underground to protect them against the effects of carbon monoxide. As a result, trials were conducted in 1953 at six mines, but the rescuer available at that time was unacceptable, both in performance and shape, and the trials were later discontinued. In 1962, trials were resumed using various types of rescuers but the main trial was with a Siebe-Gorman type of which 10,000 were distributed to selected collieries. After about four years of service, the rescuers were withdrawn due to degradation of the chemical filters which reduced the effectiveness of the masks below the accepted minimum. In 1967 a new model, the M.S.A. 230, which was designed to give protection for a minimum period of one hour against lethal percentages of carbon monoxide, was introduced and eventually extended to all collieries. Every man entering a mine was required to carry a self-rescuer and keep it on his person during the whole of his time underground. In 1968, the design of the M.S.A. 230 was modified by the addition of a heat exchanger for cooling the inspired air. This model, the 265, afforded protection for not less than one hour in lethal percentages of carbon monoxide. A further improved model, the 275, designed to give protection for at least 11 hours in lethal concentrations of carbon monoxide, is now being introduced. All men who go underground are given training in the use of self-rescuers and refresher training is carried out every two years.